The public consensus seemed to very clearly be that there was no need for yet another Pirates of the Caribbean movie especially when considering the bad taste left by the last installment, 2011's On Stranger Tides. There was no need to roll out Johnny Depp's most iconic character only for the purposes of likely tarnishing the legacy of Captain Jack Sparrow further. Of course, considering the fact On Stranger Tides still made over a billion dollars worldwide despite the lukewarm audience reaction and even worse critical reception it was almost guaranteed we'd be getting another pirate adventure at some point. Well, that day has finally come and the question this fifth installment in the franchise was going to need to answer first and foremost was that of, "Is this necessary?" It seems screenwriter Jeff Nathanson (Catch Me If You Can) understood as much and thus kicks off his attempt at a Pirates movie by re-introducing us to Henry Turner, son of William (Orlando Bloom) and Elizabeth Turner (Kiera Knightley), as he vows to his father to figure out a way to free him from the confines of The Flying Dutchmen; a ship that carries souls to the other side and only allows its captain and crew to set foot on land for one day every decade. It seemed the fates of William and Elizabeth were sealed given that post-credit stinger in At World's End, but with great power comes great responsibility and Nathanson clearly felt the importance of intertwining such fates as those of the Turner's with that of Captain Jack's. 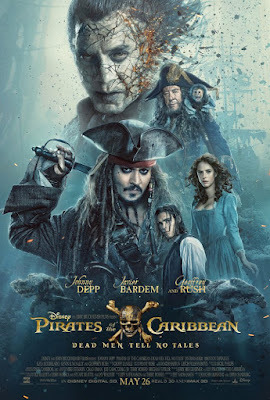 This certainly doesn't hurt and the script sets the main objective up clearly enough that we can get on board without much need for hesitation; this is especially true if you weren't a fan of the direction original screenwriters Terry Rossio and Ted Elliott took the first trilogy of films in as Dead Men Tell No Tales essentially undoes every complexity that original trilogy worked to accomplish. While that rubs me something like the wrong way given I have great admiration for what Gore Verbinski and his team accomplished the fact Dead Men Tell No Tales ends up being a rather enjoyable action romp makes me feel slightly better about Nathanson's change of course. And so, while Dead Men Tell No Tales certainly feels more significant to the overall legend of Captain Jack than the bland and generic previous film it is still unable to recapture the majesty of those first three adventures. Captain Jack is back for another adventure in Pirates of the Caribbean: Dead Men Tell No Tales. Dead Men Tell No Tales is the type of sequel general movie-goers likely wanted the first time around as opposed to the somewhat convoluted and slightly bloated sequels we actually received. I was pleasantly surprised by the darker undertones as well as the grand nature of the story that Rossio and Elliot were able to develop and construct out of an original film that they'd seemingly put every pirate idea they'd ever had into. With Dead Men Tell No Tales that aforementioned majesty is gone by way of the visual prowess that new directors to the franchise Joachim Rønning and Espen Sandberg (Kon Tiki) have chosen to pursue as their film carries a tone more akin to a Roland Emmerich picture than that of Verbinski's Nolan-esque grandiosity. Of course, Verbinski was reaching those kinds of levels well before Nolan became known for such big budget, event pictures (but that's an essay for a different day). That isn't to say Dead Men Tell No Tales is worse off for it, it could certainly be considered more fun than at least At World's End (this is all, of course, in a world where On Stranger Tides doesn't exist), but it simultaneously lessens the reverence in which we think of the films and applies a more middle of the road, less important, less game changing, but still enjoyable air to the proceedings which, at this point, is all any new Pirates movie should aspire to be. Rønning and Sandberg are able to present everything one could want out of such an adventure as less than fifteen minutes into Dead Men Tell No Tales we have yet another fantastic, if not slightly obvious, introduction to Jack Sparrow that is quickly followed by a fantastic action set piece that sees a mid-1700's style bank being pulled through a town on the island of St. Martin in the Caribbean. The directing duo show off their $250+ million budget right out of the gate as they capture the escape plan of Sparrow and his co-horts, who still include Gibbs (Kevin McNally), Scrum (Stephen Graham), and Marty (Martin Klebba), pulling the building through the streets as if Fast Five were a period piece all of which includes shots of Depp inside, on top of, and on rooftops in close proximity to this moving behemoth that takes out everything in its path. There is an inventiveness to the action that is established in this first sequence that carries through to each show-stopper whether it be Captain Jack swinging in circles while trapped in a guillotine or the finale in which the sea separates and the Black Pearl rides the crest of the water in order to try and rescue our heroes who are trapped on the sea floor. Though the rather magnificent action is in service of a rather pedestrian story it's hard to complain when something that was made for pure profit turns out to have elements of real inspiration. The story Nathanson has cooked up for the directors to serve is one part the plight of Brenton Thwaites' Henry Turner who, as mentioned earlier, is out to free his father from his curse and the revenge of Captain Salazar (Javier Bardem). Henry is serving on a British Royal Navy ship when he realizes they are headed towards what is known as the "Devil's Triangle," which is supposedly a place ships are not meant to sail and coincidentally where the ghost crew of Salazar's Silent Mary ship lie in waiting for anyone who dare invade their waters. Despite Henry's warning his superior officers decide to go in through the triangle where Salazar's men slay the whole of the crew leaving only Turner alive to tell the tale (because dead men can't) of Salazar who seeks revenge on the pirate that put him there: Jack Sparrow. After such an encounter, Turner makes his way to St. Martin where he is accused of treason and sentenced to death, but not before meeting a young woman named Carina Smyth (Kaya Scodelario) who is an astronomer that has been accused of witchcraft for possessing such knowledge. As these things go, it turns out both Henry and Carina are searching for the fabled Trident of Poseidon as it is this MacGuffin that will free Henry's father and it is this that Carina's absentee father has left her a map in the stars to locate. While waiting on their executions to take place, Henry and Carina stumble upon an imprisoned Jack Sparrow who they enlist for his ship and crew that might help them locate the Trident that they promise to help the pirate use to disarm Salazar and his crew. In the meantime, Jack has traded away his magic compass for a bottle of rum which just so happens to be the key to releasing Salazar and his ship from the Triangle setting the two on a course for destiny. Meanwhile, Geoffrey Rush's Captain Barbosa is still out among the high seas and learns of Jack giving the compass away pulling him back into the world of Jack's antics as Salazar is coming for the compass as well. Salazar finds Barbosa first who he then enlists to help him find Sparrow to which Barbosa is given little choice. Managing to pull in everyone's favorite characters from the past while at the same time creating a simple enough through line of plotting and story objectives Dead Men Tell No Tales is competent and fun enough without being ambitious in anything more than it's visual wizardry while aspiring to say little more than remind us of the fact that sometimes it's okay to simply have a good time and worry about little else. Captain Salazar (Javier Bardem) enlists the help of Captain Barbosa (Geoffrey Rush) to track down their mutual friend Jack Sparrow. It is to this point that Dead Men Tell No Tales largely succeeds more than it fails despite the fact it doesn't reach the heights of the majority of its predecessors. Dead Men Tell No Tales has the aura of a genuine, crowd-pleasing summer blockbuster and it is these standards the film seemingly held itself to. The scope of the film is large and the practicality of many of the effects is appreciated in that none of the aforementioned action sequences ever feel as if we're watching nothing more than a video game. When the film does indulge in such modern techniques though, it typically does so in cool and stimulating ways with the most obvious example of such being the design of Salazar and his crew. Much like in The Curse of the Black Pearl the crew of antagonists are a cadre undead creatures, but this time rather than simply revealing themselves to be skeletons when the moonlight hits them the crew of Salazar's Silent Mary have been cursed to remain as they were at the moment of death-when their ship was set ablaze by a young Jack Sparrow. Salazar specifically is missing half of his face as his teeth ooze ash-colored saliva every time he seethes. Such exaggerated appearances are only enhanced by the performances of the seasoned cast, chiefly Bardem who has been making menacing appealing since 2007. Having a formidable foe is key and Bardem has proved time and time again he can deliver as much, but even in something as large as Pirates of the Caribbean the actor finds new ways of striking fear into both the audience and our hero's hearts-specifically by following through on every one of the threats he makes; Nathanson's script getting rather brutal in spots with some unflinching violence. As for other performances, no other newcomers are as indelible as Bardem, but Scodelario is a close second as she lends what could have easily been a plot point of a character who spouts exposition and information into a real human with a surprisingly emotional arc that lands as intended. Thwaites is fine enough in that he is a pretty boy, much like Bloom, who rarely displays genuine charm and is more akin to a wooden board than a brave and sympathetic leading man, also much like Bloom. Of course, Will Turner never actually stood a chance of being the lead in these movies once Depp accepted the role and turned the scallywag of Captain Jack Sparrow into his own unique creation. It is likely with great relief to Depp's wallet and box office credibility that he again gets to don the mascara and dreadlocks of Jack Sparrow, but while his star has undoubtedly waned the man is still very good at what he does this time offering a Sparrow who is less put together than ever before. Leaning on the rum more than he ever has, desperate to cling to the traits that make him a pirate, never mind one of the greats, Captain Jack Sparrow has become what we all kind of knew he would no matter how many chances he was given and Depp plays into this underlying sadness as if it were a strength. Sparrow has always been a walking mishap, a dirty and selfish pirate that lived up to his label and was sincere in all his negative qualities only to briefly show glimpses of things resembling feelings. With Dead Men Tell No Tales Depp plays Sparrow with a total lack of care or interest in what is happening around him as he is more willing than ever to go where the wind takes him as long as the chance of more rum is on the table. It's almost disarming how much Sparrow dismisses the roster of main characters who are executing the films plot, but it also makes complete sense in that Sparrow has always been anything but a conventional creation and by defying all expectations in this latest installment the character remains in line with why we fell in love with him in the first place. That said, Dead Men Tell No Tales does offer Sparrow another chance to redeem his character and set off on a more promising path which is likely where it succeeds most-giving this much-loved character a fitting finale most hoped he might meet-while only time will tell if the film does the same for Depp's career.